Following on from the Cobra 220 sports concept, Aeon have now given the Cobra ATV more bite by increasing its capacity to 313cc. The increase in capacity has also seen an increase in torque and horsepower thanks to the new liquid cooled four stroke engine that delivers its power through a CVT transmission to the rear wheels via chain drive. 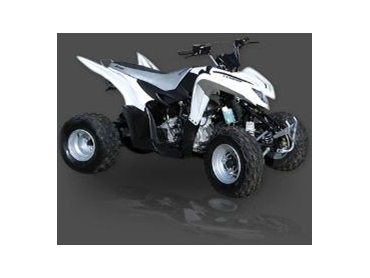 Sports quads can be intimidating but the Aeon Cobra 350 ATV has been able to combined high performance with ease of riding by using a CVT transmission that requires no gear changes and a chassis that is extremely balanced and stable at high speed. With double wishbone suspension ,adjustable spring pre-load and disc brakes front and rear helping the Cobra ATV handle and stop like a true thorabread.